In another innovative move, the Seafood Watch team at the Monterey Bay Aquarium offers a video webcast to help consumers learn about making smart choices at the seafood counter. Tune in next Friday to participate (instructions/link below). 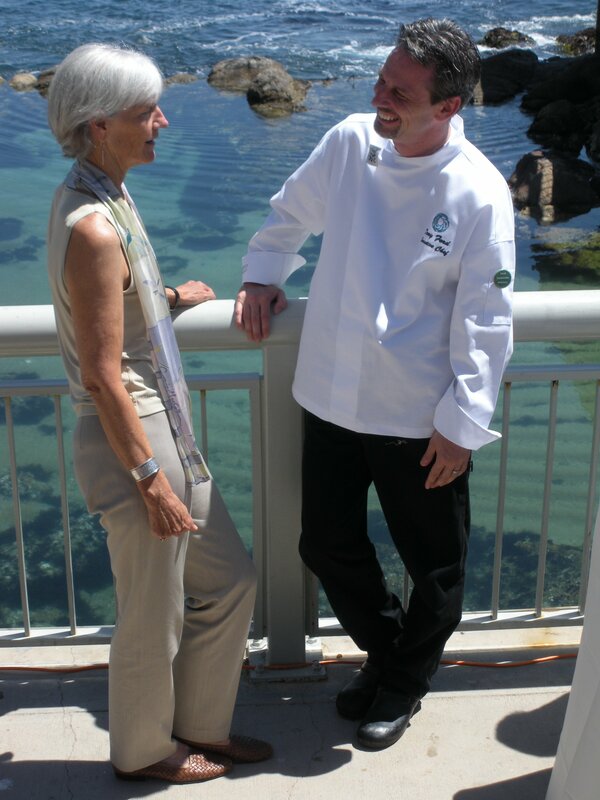 Having met Chef Dory Ford at the recent Sustainability conference Cooking for Solutions, I can tell you he’s a great chef, very approachable and obviously dedicated to educating the public about how delicious responsible seafood choices can be. One of the great things about the conference was the message that we are able to make a difference with every dollar we spend on seafood. Here is Chef Ford after a demo in which he cooked with kids, chatting with Aquarium Executive Director Julie Packard. Every day, you play a critical role in shaping the future of our oceans. By making smart seafood choices at the market and at restaurants, you can help keep our oceans healthy for generations to come. Get the inside scoop on what seafood to savor and what fish to avoid by joining our online video webcast here. Our experts, including Seafood Watch Outreach Manager Sheila Bowman, Executive Chef of the Aquarium’s Portola Cafe Dory Ford and host Ken Peterson will empower you to make sustainable seafood choices that are good for you and healthy for our oceans. And they’ll share some exquisite sustainable seafood recipes from the Aquarium’s annual Cooking for Solutions event. During next Friday’s webcast, you’ll also learn how you can be an advocate for our oceans, both with your purchasing power and by sharing your seafood smarts with friends and family. Register today for Seafood Watch – Make Choices for Healthy Oceans webcast, which will take place on Friday, June 13 at noon Pacific time. With nearly 75 percent of the world’s fisheries either fully fished or overfished, choosing sustainable seafood is more important than ever before.